Professor George A. Gogotsi is a lead researcher at the G. S. Pisarenko Institute for Problems of Strength of the National Academy of Sciences of Ukraine and the R&D director of the Materials Research Centre. His scientific interests include the behavior of various fragile materials (ceramics, single crystals, glass, refractories) under mechanical and thermal loading over wide temperature ranges and the physical processes controlling their deformation and fracture, which were also the subjects of his Ph.D. (1967) and D.Sc. (1986) theses. He studied the ceramics and different ceramic composites for magnetohydrodynamic generators, rocket engines, continuous-casting machines, gas-turbine, and armored protection as well as single crystals of zirconia and alumina for scalpels, dental and orthopedic implants. For these studies, new testing methods and facilities many of which meet CEN and ISO’s latest standards were developed (they were protected by 40 inventors’ certificates of the former USSR). Among his original inventions are setups and methods for determining mechanical characteristics of fragile materials in the temperature range -150°С –1500°С, facilities for heat-resistance testing of hollow cylindrical specimens (heating to 2800°С at a programmed heating rate followed by the laser measurement of thermal expansion), panel radiant-heat furnace awarded a Gold Medal of the All-Union Exhibition of Achievements of National Economy, and many other. This made it possible to conduct research at the highest scientific and technological level and to publish the results in national and international journals. Vice-President of the Academy of Sciences. of USSR Vinogradov P.A. Gogotsi introduced such concepts related to applied mechanics of materials as “measure of fragility,” “base diagram,” “R-line,” etc. He also participates in the development of new ceramic materials, especially those based on zirconia, for engineering and medicine (protected by 10 inventors’ certificates of the USSR and patents of Ukraine). Gogotsi is the author and co-author of more than 270 scientific publications in national and international journals (his ISI h-index = 12). On graduating from the Kiev Polytechnical Institute as a turbine engineer, Gogotsi started his work at the design office of the South Turbine Plant where the first Soviet marine gas turbine was created (he used this experience when participated in the development of the first Soviet ceramic tank turbine and its materials). Later, he worked at the Turbine Department of the Kiev Polytechnical Institute and at the Institute of Thermophysics and as an R&D administrator at the State Committee of the Council of Ministers of the USSR. At that time, he also conducted research at the Institute for Problems of Materials Science. 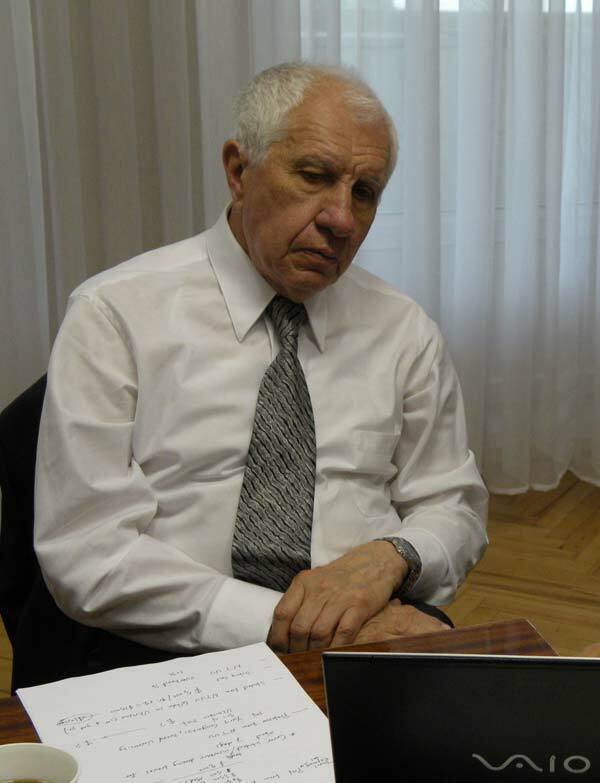 In the 1960s, Gogotsi was a member of the Committee of Youth Organizations of Ukraine, vice chairman of the Federation of Tourism, and a chairman of the Board of Tourism Judges of Ukraine. He took part in the organization of underwater sports. 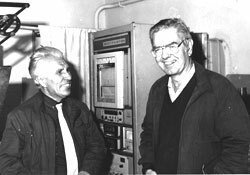 In the 1970s, he was a member of the Science and Engineering Council of the Academy of Sciences of the USSR on direct conversion of thermal and nuclear energy to electricity, which was then headed by A. P. Aleksandrov, future President of the Academy of Sciences of the USSR, cooperated with academician V. P. Mishin (a follower of S. P. Korolev, the founder of the Soviet rocket technology), academician M. D. Millionshchikov (a noted expert in nuclear engineering), and other outstanding scientists, and was an academic secretary of the Ukrainian Branch of this council then headed by A. N. Shcherban, a deputy chairman of the Council of Ministers of the USSR. In the 1980s, Gogotsi was a member of the Armored-Protection Commission of the Industry-Military System of the USSR. After withdrawing from defense research, he worked as an administrator and researcher in Comecon ceramics projects and was the director of a diversified company Gobor Inc. In 1990 and 1992, Gogotsi was trained in Australia. Now prof. G.A. Gogotsi is the chairman of the Technical Committee on Engineering Ceramics of the State Standard of Ukraine and a member of the editorial board of the Russian journal Ogneupory (Refractories). In 1999, he was elected as professor of the Institute of Materials (Great Britain). In addition to research and engineering activity, Gogotsi worked as a sports, engineering, and science journalist for Ukrainian newspapers and magazines. He participated in the preparation of the first Ukrainian Soviet Encyclopedia. More details of Gogotsi’s biography can be found in Who’s Who in the World, Who’s Who in Science and Еngineering (Marquis, the USA), The Cambridge Blue Book (Great Britain), and other biographic information publications. 1. G. A. Gogotsi, S. P. Mudrik, Fracture resistance of technical and optical glasses: edge flaking of specimens, Strength of Materials, 42 (2010) 280 – 286. 2. G. A. Gogotsi, S. P. Mudrik, Glasses: New approach to fracture behavior analysis, Journal of Non-Crystalline Solids, 356 (2010) 1021-1026. 3. G. A. Gogotsi, V.I. Galenko, S.P. Mudrik, B.I. Ozersky, V.V. Khvorostyany, T.A. Khristevich, Fracture resistance estimation of elastic ceramics in edge flaking: EF baseline, Journal of the European Ceramic Society, 30 (2010) 1223-1228. 4. G. A. Gogotsi, V.I. Galenko, S.P. Mudrik, B.I. Ozersky, V.V. Khvorostyany, T.A. Khristevich, Fracture behaviour of Y-TZP ceramics: New outcomes, Ceramics international, 36 (2010) 345-350. 5. G. A. Gogotsi, Fracture behaviour of Mg–PSZ ceramics: Comparative estimates, Ceramics International, 35(2009) 2735 – 2740. 6. G. A. Gogotsi, S. P. Mudrik, Fracture barrier estimation by the edge fracture test method, Ceramics International, 35 (2009) 1871 – 1875. 7. G.A. Gogotsi, Mechanical behaviour of a silicon nitride particulate ceramic composite, Ceramics International, 35 (2009) 1109-1114. 8. G. A. Gogotsi, S. P. Mudrik, V. I. Galenko, Evaluation of fracture resistance of ceramics: Edge fracture tests, Ceramics International, 33 (2007) 315–320. 9. G. A. Gogotsi, Flaking toughness of advanced ceramics: ancient principle revived in modern times, Mat. Res. Innov. , 10-2, (2006) 45-47, 179-186. 10. M. Lugovoy, V. Slyunyayev, V. Subbotin, N. Orlovskaya, G. A. Gogotsi, Crack arrest in Si3N4-based layered composites with residual stress, Compos. Sci. Technol., 64 (2004) 1947-1957. 11. G.A. Gogotsi, Fracture toughness of ceramics and ceramic composites, Ceramics International, 29 (2003) 777-784. 12. M. Lugovoy, V. Orlovskaya, V. Slyunyayev, G. Gogotsi, J. Kubler, A.J. Sanchez-Herencia, Crack bifurcation features in laminar specimens with fixed total thickness, Compos. Sci. Technol., 62 (2002) 819-830. 13. G. A. Gogotsi, M. Lugovoy, Local stochastic analysis of microcracking and non-elastic behavior of ceramics, Theoret. Appl. Fract. Mech., 36 (2001) 115-213. 14. K. Kleveland, N. Orlovskaya, T. Grande, A.-M. Moe, M.-A. Einarsrud, K. Breder, G. A. Gogotsi, Ferroelastic behavior of LaCoO3-based ceramics, J. Am. Ceram. Soc., 84 (2001) 2029-2033. 15. G.A. Gogotsi, Mechanical behavior of yttria and ferric oxide-doped zirconia at different temperatures, Ceramics International, 24 (1998) 589-595. 16. G.A. Gogotsi, Elastic-inelastic and inelastic-elastic transitions in ZrO2 materials, Journal of the European Ceramic Society, 17 (1997) 1213-1215. 17. G.A. Gogotsi, V.P. Zavada, M.V. Swain, Mechanical property characterization of a 9 mol% Ce-TZP ceramic material: 2. Fracture toughness, Journal of the European Ceramic Society, 16 (1996) 545-551. 18. G.A. Gogotsi, D.Yu. Ostrovoy, Deformation behavior of partially stabilized ZrO2 crystals in the temperature range of tetragonal to monoclinic transformation, J. Mater. Sci. Let., 15 (1996) 1467-1470. 19. S.N. Dub, G.A. Gogotsi, E.E. Lomonova, Hardness and fracture toughness of tetragonal zirconia single crystals, J. Mater. Sci. Let., 14 (1995) 46-49. 20. G.A. Gogotsi, D.Yu. Ostrovoy, Mechanical behavior of partially stabilized zirconia crystals with terbia and ceria additives, Journal of the European Ceramic Society, 15 (1995) 1177-1184. 21. G.A. Gogotsi, V.P. Zavada, M.V. Swain, Mechanical property characterization of a 9 mol% Ce-TZP ceramic material: 1. Flexural response, Journal of the European Ceramic Society, 15 (1995) 1185-1192. 22. G.A. Gogotsi, D.Yu. Ostrovoy, Indentation fracture of Y2O3 partially stabilized ZrO2 crystals, J. Mater. Sci. Let., 14 (1995) 1406-1409. 23. G.A. Gogotsi, S.N. Dub, E.E. Lomonova, B.I. Ozersky, Vickers and Knoop indentation behavior of cubic and partially stabilized zirconia crystals, Journal of the European Ceramic Society, 15 (1995) 405-413. 24. G.A. Gogotsi, D.Yu. Ostrovoy, Deformation and strength of engineering ceramics and single crystals, Journal of the European Ceramic Society, 15 (1995) 271-281. 25. G.A. Gogotsi, E.E. Lomonova, Yu.A. Furmanov, I.M. Savitskaya, Zirconia crystals suitable for medicine: 1. Implants, Ceramics International, 20 (1994) 343-348. 26. G.A. Gogotsi, E.E. Lomonova, V.G. Pejchev, Strength and fracture toughness of zirconia crystals, Journal of the European Ceramic Society, 11 (1993) 123-132. G.A. Gogotsi, Yu.G. Gogotsi, V.P. Zavada, V.V. Traskovsky, The effects of air and sodium salts on the strength of silicon-nitride-based ceramics, Mater. High Temp., 9 (1991) 209-216. 28. A.D. Drozdov, V.O. Galenko, G.A. Gogotsi, M.V. Swain, Acoustic emission during micro- and macrocrack growth in Mg-PSZ, J. Am. Ceram. Soc., 74 (1991) 1922-1927. 29. A. Krell, T. Reich, A. Beger, G.A. Gogotsi, Y.L. Groushevsky, The effect of SiO2 on high temperature deformation and strength of zirconia-toughened alumina, J. Mater. Sci., 26 (1991) 4637-4642. 30. G.A. Gogotsi, Deformation behavior of ceramics, Journal of the European Ceramic Society, 7 (1991) 87-92. 31. S.P. Badwal, M.V. Swain, G.A. Gogotsi, Ionic conductivity of 2 mol% Y2O3 + 2 mol% Yb2O3-ZrO2 single grain, Mater. Forum, 15 (1991) 383-387. 32. G. A. Gogotsi, Thermal stress behavior of yttria, scandia and AlN ceramics, Ceramics International, 5 (1990) 31-35. 33. G. A. Gogotsi, The use of brittleness measure x to represent mechanical behavior of ceramics, Ceramics International, 15 (1989) 127-129. 34. G. A. Gogotsi, Yu.G. Gogotsi, D.Yu. Ostrovoy, Mechanical behavior of hot-pressed boron carbide in various atmospheres, J. Mater. Sci. Let., 7 (1988) 814-816. 35. G. A. Gogotsi, Ya.L. Groushevsky, O.B. Dashevskaya, Yu.G. Gogotsi, V.A. Lavrenko, Complex investigation of hot-pressed boron carbide, Journal of Less-Common Metals, 117 (1986) 225-230. (в 1992 г. Переименован в Journal of alloys and compounds: an interdisciplinary journal of materials science and solid-state chemistry and physics). 36. G. A. Gogotsi, Ya.L. Groushevsky, Statistical studies of the strength of inelastic ceramics, Ceramics International, 8 (1982) 22-26. 37. G. A. Gogotsi, Ya.L. Groushevsky, K.K. Strelov, The significance of non-elastic deformation in the fracture of heterogeneous ceramic materials, Ceramics International, 4 (1978) 113-118. 1. G.A. Gogotsi, Fracture resistance of ceramics: direct measurements, Advan. Sci. Techn., 45 (2006) 95-100. 2. F. Berto, G.A. Gogotsi, P. Lazzarin, Generalised stress intensity factors applied to fracture toughness data from V-notches with small root radius, in: Proceedings of the 11th International Conference on Fracture, Turin (Italy), 2005. 3. G.Gogotsi, S. Mudrik, A. Rendtel, Sensitivity of silicon carbide and other ceramics to edge fracture: method and results, in: Lara-Curzio, E., Readey, M. (Eds. ), 28th Int. Conf. Advan. Ceram. and Compos. : B. Am. Ceram. Soc., Westerville., 25 (2004) 156–163. 4. G.A. Gogotsi, Fracture toughness studies on ceramics and ceramic particulate composites at different temperatures, in: Salem, J.A., Quinn, G.D., Jenkins, M.G. (Eds. ), Fracture Resistance Testing of Monolithic and Composite Brittle Materials. STP 1409, ASTM Int., West Conshohocken (2002) 199–212. 5. D.Y. Lee, G.A.Gogotsi, D.-J. Kim, N.-J.Park., Hydrothermal stability of zirconia ceramics, Journal of the Korean Ceramic Society, 39 (2002) 190-193 (на корейском). 6. M.A. Borik, Yu.K. Voronko, E.E. Lomonova, V.V.Osiko, V.A. Sarin, G.A.Gogotsi, Mechanical properties of PSZ crystals grown by skull melting technique: influence of technology conditions, in: Bradt R.C., Munz D., Sakai M., V.Yu. Shevchenko, R.R.White (Eds. ), Fracture Mechanics of Ceramics, vol. 13 (2002) 485-496. 7. G.A. Gogotsi, Mechanical behavior of zirconia crystals, in: VincenziniP. (Ed.) 9th Cimtec-World Ceram. Cong., Techna Srl., Italy, (1999) 759-766. 8. G.A. Gogotsi, Raman investigation and mechanical behavior of zirconia, Proc. of ASME’97, USA, (1998) 187-195. 9. G.A. Gogotsi, I. Malecki, J. Ranachowski, Zastosowanie metody emisji akustycznej do badania procesu zniszczenia materialow ceramicznych pod obciazeniem mechanicznym, Ceramics’54, Polish Ceram. Bull., 16 (1997) 503-513. 10. G.A. Gogotsi, Deformation behavior of ceramics materials at low and high temperatures, Thermal Stresses’97, (1997) 695-698. 11. S.N. Dub, G.A.Gogotsi, Indentation fracture toughness of zirconia ceramics, J. Aust. Ceram. Soc., 32 (1996) 11-15. 12. Gogotsi G., Ostrovoy D., Strength and fracture of partially stabilized zirconia crystals under different loading conditions, Fourth Euro Ceram., Faenza, Italy, 3 (1995) 107-114. 13. Semchenko G.D., Scorodumova O.B., Gogotsi G.A., Elaboration of ultra fine mullite powder and strong advanced ceramics from sol-gel method, Fourth Euro Ceram., Faenza, Italy, 3 (1995) 97-104. 14. Gogotsi, G., Ostrovoy D., Deformation and fracture of zirconia for energy application, Ceram. in Energy Application, (1994) 369-379. 15. G.A. Gogotsi, The significance of non-elastic deformation in the thermal shock of heterogeneous ceramics materials, in: Schneider G, Petzow G. (Eds. ), Thermal Shock and Thermal Fatigue Behavior of Advan. Ceram., Kluwer Academic Publ., Netherlands, (1993) 279-291. 16. G.A. Gogotsi, V.I. Galenko, V.P. Zavada, M.V. Swain, Influence of heating rate on the thermal strain induced fracture of Mg-PSZ ceramics, in: Schneider G, Petzow G. (Eds. ), Thermal Shock and Thermal Fatigue Behavior of Advan. Ceram., Kluwer Academic Publ., Netherlands, (1993) 293-305. 17. G.A. Gogotsi, M. Swain, Comparison of strength and fracture toughness of single and polycrystalline zirconia, Sci. and Technol. of Zirconia V, Technomic Publ. Corp., Lancaster-Basel (1993) 347-359. 18. G.A. Gogotsi, Test methods of advanced ceramics – reasonable approaches to certification of ceramics, Key Eng. Mater., 56-57 (1991) 419-434. 19. G.A. Gogotsi, A.V. Drozdov, V.P. Zavada, M.V. Swain, Comparison of the mechanical behavior of zirconia partially stabilized with yttria and magnesia, J. Aust. Ceram. Soc., 27 (1991) 37-43. 20. Herrmann M., Kessler S., Taut Ch., Gogotsi G., V. Zavada, Microstructure and mechanical properties of sintered reaction bonded silicon nitride, in: Carlsson R., Johansson T., Kahlman L. (Eds. ), 4th Int. Symp. Ceram. Mater. and Components for Engines, Elsevier Appl. Sci. (1991) 237-243. 21. G.A. Gogotsi, Festigkeitsprobleme von keramischen werkstoffen, Silikattechnik, 39 (1986) 25-28. 22. G.A. Gogotsi, A.N. Negovsky, Non-destructive control in thermal shock resistance testing of structural ceramics, 9th Cong. Mater. Testing, Budapest, vol., 11 (1986) 610-611. 23. G.A. Gogotsi, A.N. Negovsky, Evaluation of ceramic fracture caused by thermal shock, Adv. Fracture Res., 4 (1984) 2701-2709. 24. G.A. Gogotsi, A.V. Drozdov, A.N. Negovsky, АЭ при деформировании и разрушении керамики, Proc. Conf. Ultrasonic Int., Halifax, Canada, (1983) 67-73. 25. G.A. Gogotsi, Ya.L. Groushevsky, Investigation of thermal shock resistance of ceramic materials under programmed heating, in: Heller R., Hasselmann D. (Eds. ), Thermal Stress in Severe Environments, Plenum Publ. Corp., N.Y. (1980) 591-606. 26. G.A. Gogotsi, Ya.L. Groushevsky, Investigation of strength of ceramic materials taking into account the peculiarities of their mechanical behavior, 21st Polish Solid Mechan. Conf., Porabka-Kozubnic, (1979) 49-50. 1. Г.А. Гогоци, Испытания керамики на трещиностойкость: EF метод, Неорган. матер., № 5, стр. 628-633, 2006. 2. Г.А. Гогоци, Трещиностойкость современной керамики и керамических композитов: EF-метод, Порошковая металлургия, №7/8, стр. 39-49, 2006. 3. Г.А. Гогоци, Трещиностойкость современной керамики и керамических композитов: SEVNB-метод, Порошковая металлургия, № 7/8, стр. 54-67, 2004. 4. Д.Ю. Островой, Г.А. Гогоци, С.А. Суворов, А.П. Шевчик, Деформирование и разрушение керамики на основе хромита лантана, Огнеупоры и техн. керамика, № 3, стр.10-20, 2002. 5. Г.А. Гогоци, В.И. Галенко, Б.И. Озерский, А.Д. Васильев, В. И. Корбань, Сопротивление разрушению, прочность и другие характеристики циркониевой керамики, стабилизированной оксидом иттрия, Огнеупоры и техн. керамика, № 8/7, стр.13-15, 2000. 6. О.Н. Григорьев, Г.А. Гогоци, Ю.Г. Гогоци и др. Синтез и свойства керамики системы SiC-B4C-MeB2, Порошковая металлургия, № 5/6, стр.29–42, 2000. 7. Г.А. Гогоци, Микро-Рамановские исследования материалов на основе диоксида циркония, Порошковая металлургия, № 3/4, 88-96, 1999. 8. Г.А. Гогоци, Трещиностойкость керамики и композитов с керамической матрицей (метод SEVNB), Огнеупоры и техн. керамика, № 11, стр.7-13, 1998. 9. Г.А. Гогоци, Рамановская спектроскопия и механическое поведение диоксид циркониевых материалов, Огнеупоры и техн. керамика, № 6, стр.13-19, 1997. 10. M.A. Aboimov, M.A. Borik, G.A. Gogotsi, V.F. Kalabukhova, E.E. Lomonova, V.A. Myzina, Phase Transitions in Crystals of Partially Stabilized Zirconia, Неорган. матер. № 3, стр. 285-290, 1997. 11. Г.А. Гогоци, В.И. Галенко, В.П. Завада, и др., К вопросу об оценке трещиностойкости керамики из Si3N4 и ZrO2, Огнеупоры и техн. керамика, № 1, стр. 21-26, 1996. 12. Г.А. Гогоци, Б.И. Озерский, Д.Ю. Островой, Сопротивление индентированию керамики и кристаллов, Огнеупоры и техн. керамика, № 3, стр.2-8, 1996. 13. Г.А. Гогоци, В.И. Галенко, Б.И. Озерский, Трещиностойкость и другие характеристики керамики из частично стабилизированного диоксида циркония с добавкой оксида железа, Огнеупоры и техн. керамика, № 2, стр.2-9, 1996. 14. Г.А. Гогоци, С.Н. Дуб, Б.И Озерский и др., Кристаллы диоксида циркония с оксидами иттрия и церия, Огнеупоры, № 7, стр. 2-10, 1995. 15. Г.А. Гогоци, В.И. Галенко, В.П. Завада, М.В. Свейн, Деформирование и разрушение диоксидциркониевой керамики, стабилизированной Се2О3. 2. Трещиностойкость, Огнеупоры, № 3, стр. 8-11, 1995. 16. Г.А. Гогоци, В.И. Галенко, В.П. Завада, М.В. Свейн, Деформирование и разрушение диоксид циркониевой керамики, стабилизированной Се2О3. 1. Прочность и деформативность, Огнеупоры, № 1, 8-11, 1995. 17. Г.А. Гогоци, Механическое поведение кристаллов диоксида циркония с добавкой оксидов иттрия и церия, Порошковая металлургия, № 9/10, стр.75-84, 1995. 18. Г.А. Гогоци, К вопросу о термостойкости гетерогенной керамики и огнеупоров, Огнеупоры, № 11, стр.2-8, 1993. 19. Г.А. Гогоци, В.И. Галенко, Б.И. Озерский и др., Прочность и трещиностойкость кристаллов диоксида циркония с оксидами иттрия и тербия, Огнеупоры, № 6, стр.2-7, 1993. 20. Г.А. Гогоци, Б.И. Озерский, О.Б. Оксаметная, Поведение поли- и монокристаллического диоксида циркония при внедрении индентора, Огнеупоры, № 11/12, стр.4-9, 1992. 21. Г.А. Гогоци, Е.Е. Ломонова, Деформационные особенности кубических монокристаллов ZrO2, Огнеупоры, № 3, стр.15-19, 1992. 22. Г.А. Гогоци, Д.Ю. Островой, Деформационные особенности керамики при нагреве, Огнеупоры, № 1, 15-19, 1992.
. Г. А. Гогоци, Деформирование, сопротивление разрушению и термостойкость упругих и неупругих керамических материалов // Пробл. прочности. — 2013. — № 2. — С. 171 – 181. 1. Г. А. Гогоци, С. П. Мудрик, Трещиностойкость технического и оптического стекол: скалывание кромок образцов // Пробл. прочности. — 2010. — № 3. — С. 57 – 65. 1. Г. А. Гогоци, В. И. Галенко, С. П. Мудрик, и др. Разрушение стекла при краевом скалывании // Пробл. прочности. — 2007. — № 6. — С. 103 – 112. 2. Г. А. Гогоци Сопротивление керамики разрушению: базовая диаграмма и R-линия // Пробл. прочности. — 2006. — № 3. — С. 60 – 74. 3. Г. А. Гогоци, В. И. Галенко, Озерский Б. И., Т. А. Христевич Сопротивление керамики разрушению: метод скалывания кромки // Пробл. прочности. – 2005. – № 5. – С. 84 – 92. 4. Островой Д. Ю., Г.А. Гогоци, С. А. Горбань, и др. Прочность и трещиностойкость керамических материалов, предназначенных для металлокерамического протезирования в стоматологии // Пробл. прочности. – 2005. – № 3. – С. 128 – 139. 5. Г. А. Гогоци, С. П. Мудрик Трещиностойкость керамики при скалывании кромки образцов (EF метод) // Пробл. прочности. — 2004. — № 5. — С. 133–137. 6. Г. А. Гогоци Изучение трещиностойкости керамики на образцах с V-образным надрезом // Пробл. прочности. — 2000. — № 1. — С. 120—127. 7. Г. А. Гогоци Деформационное поведение диоксидциркониевых материалов // Пробл. прочности. — 1998. — № 6. — С. 106—115. 8. Г. А. Гогоци, Д. Ю. Островой Механическое поведение керамики и кристаллов на основе диоксида циркония. 1. Испытания при индентировании // Пробл. прочности.— 1995.— № 8. — С. 41 — 47. 9. Г. А. Гогоци, Ю. И. Комоликов, Ю. С. Торопов и др. Прочность и трещиностойкость керамики на основе диоксида циркония ZrO2 // Пробл. прочности. – 1988.– № 1. – С. 50 – 52. 10. Г. А. Гогоци, Гриднева И. В., Я. Л. Грушевский и др. Прочность и трещиностойкость керамики. Сообщ. 4. Керамика на основе карбида бора // Пробл. прочности. – 1987.– № 10. – С. 31 – 35. 11. Г. А. Гогоци, Гнесин Г. Г., Я. Л. Грушевский и др. Прочность и трещиностойкость керамики. Сообщ. 3. Карбидокремниевая керамика // Пробл. прочности. – 1987.– № 5. – С. 77 – 80. 12. Г. А. Гогоци, Завада В. П. Оценка долговечности керамики по параметрам докритического роста трещин // Пробл. прочности. – 1985.– № 2. – С. 53 – 56. 13. Г.С. Писаренко, Г.А. Гогоци, В.П. Завада. Трещиностойкость конструкционной керамики // Пробл. прочности. – 1985. – № 4. – С. 3-8. 14. Г. А. Гогоци, Завада В. П., Ф. Я. Харитонов Прочность и трещиностойкость керамики. Сообщ. 1. Кордиерит // Пробл. прочности. — 1984. — № 12. — С. 7—11. 15. Г. А. Гогоци, Я. Л. Грушевский Система автоматизированного сбора и обработки результатов испытаний прочности и термостойкости // Пробл. прочности. — 1984. — № 5. — С. 115—119. 16. Г. А. Гогоци, Кушниренко А. М., Ж. С. Бурман и др. Исследование влияния механической обработки на прочность окисных керамических материалов // Пробл. прочности. – 1980. — № 3. – С. 81—84. 17. Писаренко Г. С., Г. А. Гогоци Исследование конструктивной прочности керамики применительно к элементам проточной части ГТД // Пробл. прочности. — 1980. — № 4. — С. 3—10. 18. Г. А. Гогоци, Захаров А. И., А. М. Кушниренко и др. Исследование прочности керамических материалов при силовых и тепловых воздействиях. Сообщ. 1. Окись иттрия // Пробл. прочности. – 1979. — № 10. – С. 46—50. 19. Г. А. Гогоци Анализ диаграмм деформирования и классификация малодеформирующихся материалов по особенностям их поведения при силовых воздействиях // Пробл. прочности. – 1978. — № 3. – С. 98 — 101. 20. Г. А. Гогоци, Л. П. Примак, В. А. Степаненко и др. Исследование особенностей разрушения керамических материалов при термоударных нагружении // Пробл. прочности. – 1977. — № 7. – С. 98—103. 21. Г. А. Гогоци К вопросу о классификации малодеформирующихся материалов по особенностям их поведения при нагружении // Пробл. прочности. – 1977. — № 1. – С. 77—82. 23. Г. А. Гогоци Исследование некоторых вопросов разрушения термически нагружаемых огнеупоров // Пробл. прочности. – 1974 — № 5. – С. 64 — 67. 24. Г. А. Гогоци, Л. А. Коздоба, Кривошей Ф. А. Определение термической стойкости и теплофизических характеристик корундовых материалов // Пробл. прочности. – 1971. — № 1. – С. 92 — 96. 25. Г. А. Гогоци, Ю. П. Котельников, Ю. Н. Ланкин и др. Программноуправляемая установка лучистого нагрева // Пробл. прочности. – 1970. — № 7. – С. 94 — 97. 26. Г. А. Гогоци, Р. И. Куриат, Б. И. Тереховский и др. Исследование разрушения алюмосиликатных огнеупоров, содержащих нитрид бора // Пробл. прочности. – 1970. — № 3. – С. 47 — 50. 27. Г. А. Гогоци К методике испытания термостойкости хрупких материалов на полых цилиндрических образцах // Пробл. прочности. – 1970. — № 2. – С. 96 — 100. Fracture resistance estimation, edge fracture, edge flaking, and edge chipping problems. 1. G. A. Gogotsi and S. P. Mudrik, Glasses: New approach to fracture behavior analysis, J. Non-Cryst. Solids (2010), doi:10.1016/j.jnoncrysol.2010.01.021. 2. G. A. Gogotsi, V.I. Galenko, S.P. Mudrik, B.I. Ozersky, V.V. Khvorostyany, T.A. Khristevich, Fracture resistance estimation of elastic ceramics in edge flaking: EF baseline. Journal of the European Ceramic Society, 30 (2010) 1223-1228. 3. G. A. Gogotsi, V.I. Galenko, S.P. Mudrik, B.I. Ozersky, V.V. Khvorostyany, T.A. Khristevich, Fracture behaviour of Y-TZP ceramics: New outcomes, Ceramics international, 36 (2010) 345-350. 4. G. A. Gogotsi, Fracture behaviour of Mg-PSZ ceramics: Comparative estimates, Ceramics International, 35 (2009) 2735-2740. 5. G. A. Gogotsi, S. P. Mudrik, Fracture barrier estimation by the edge fracture test method, Ceramics International, 35 (2009) 1871-1875. 6. G. A. Gogotsi, Mechanical behaviour of a silicon nitride particulate ceramic composite, Ceramics International, 35 (2009) 1109-1114. 8. Г. А. Гогоци, В. И. Галенко, Б. И. Озерский, Т. А. Христевич, В. И. Карбань, Прямое определение сопротивления керамики разрушения по методу краевого скалывания.73 (2007) 49-53. 9. G. A. Gogotsi, V. I. Galenko, S. P. Mudrik, B. I. Ozerskii, V. V. Khvorostyany, and T. A. Khristevich, Glass fracture in edge flaking, Strength of Materials, 39 (2007) 639-645. 10. G. A. Gogotsi, Fracture resistance of ceramics: base diagram and R-line, Strength of Materials, 38 (2006) 261-270. 11. G. A. Gogotsi, Fracture resistance of ceramics: direct measurements, Advan. Sci. Techn., 45 (2006) 95-100. 12. G. A. Gogotsi, Fracture resistance of advanced ceramics: alternative estimations, (2006) 382-386. 13. G. A. Gogotsi, Fracture toughness testing of materials by the EF method, Inorganic materials, 42 (2006) 567-572. 14. G. A. Gogotsi, Flaking toughness of advanced ceramics: ancient principle revived in modern times, Mat. Res. Innov., 10-2, (2006) 45-47, 179-186. 15. G. A. Gogotsi, Refractory and ceramic materials crack resistance of modern ceramics and ceramic composites. II. EF method, Powder metallurgy, 45 (2006) 328-336. 16. G. A. Gogotsi, V. I. Galenko, B. I. Ozerskii, and T. A. Khristevich, Fracture resistance of ceramics: edge fracture method, Strength of Materials, 37 (2005) 449-505. 17. G. A. Gogotsi and S. P. Mudrik, Brief communications fracture resistance of ceramics upon edge chipping, Strength of Materials, 36 (2004) 545-547. 18. G. A. Gogotsi and S. P. Mudrik, Sensitivity of silicon carbide and other ceramics to edge fracture: method and results, The American Ceramic Society, 25 (2004) 236-246.